The Memorial Candle Program has been designed to help offset the costs associated with the hosting this Tribute Website in perpetuity. Through the lighting of a memorial candle, your thoughtful gesture will be recorded in the Book of Memories and the proceeds will go directly towards helping ensure that the family and friends of Chi Kin Chung can continue to memorialize, re-visit, interact with each other and enhance this tribute for future generations. Chi Kin Chung passed away on Sunday, March 20th, 2016 at the age of 93. She was born in Hong Kong in 1922. When she was 18 years old, she obtained an Education Diploma and started her career as a teacher. She taught in Junior high school until she retired at 60 years old. After that she traveled all over the world. In 1989 she moved to Canada with her husband and lived in Toronto for a while and then moved to Calgary. She enjoyed writing poems, knitting and traveling. The family would like to extend thanks to Doctor Todd as well as the many staff of Bow View Manor Nursing Home for the quality of care provided over the last three years. Chi Kin Chung is survived by 5 children Margaret Chow, Kitty Leung, Mary Siu, Sabrina Lam and Paul Leung; son in-law Simon Lam; daughter in-law Chan Wai Yee; 9 grandchildren Vincent Chow, Simon Chow, Veronica Siu, Rene Siu, Sharon Siu, Elizabeth Lam, Leung Sum Shun, Leung Sum Shing and Leung Sum Wo; 3 grandson-in-laws Henry Lek, Ng Wairan and Tsui Man Chun; 2 granddaughter-in-laws Jennifer Young and Lillian Chow; 6 great-grandchildren Jonathan Chow, Maximus Chow, Allison Chow, Ada Chow, Brandon Lek and Tsui Lok Yung. 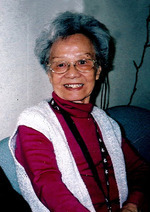 Chi Kin Chung was predeceased by her husband Leung Tong Dai. Prayer Service will be held at Our Lady of Perpetual Help (400 Edmonton Trail NE) on Thursday, March 31, 2016 at 6:30 pm. Funeral Mass will be celebrated at Our Lady of Perpetual Help Catholic Church (400 Edmonton Trail NE) on Friday, April 1, 2016 at 11:00 am. Graveside Service to follow at Queen's Park Cemetery. Complete obituary information to follow. To view and share photos, condolences and stories of Chi Kin please visit www.choicememorial.com. Arrangements entrusted to the care of Choice Memorial Cremation & Funeral Services (403) 277-7343.